Have you ever messed up? Have you ever made such a mistake you thought you could never get over it? Have you thought about just quitting? Then this message is for you! One of the common occurrences of the human condition is that we mess up. No matter how hard we try, from time to time we just blow it! We miscalculate, we procrastinate, we overestimate – and the result is we let someone down in a big way. The Bible doesn’t hide the stories of failure of even its biggest heroes. 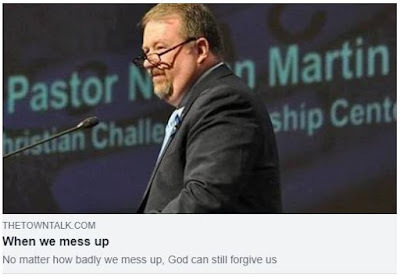 Rather than sugarcoat their lives with pretend perfection, the Bible paints vivid pictures of passionate, alive men and women who live life loudly, and sometimes mess up loudly as well! Peter is one of those passionate protagonists whose story makes us all feel a little better about ourselves. If any of the apostles were going to put his foot in his mouth, it would be Peter! He was quick to judge, quick to offer an opinion, even quick to rebuke Jesus Himself when he thought Jesus was wrong. But thank God that Jesus doesn’t leave us in our failure! After Jesus rose from the dead Mark reports that He specifically sent word to Peter to meet Him in Galilee (Mark 16:7). And when Jesus met them on the seashore He made sure to get across to Peter a very important message – that not even his failures could separate him from God’s love! Serious students of the Scriptures recognize that Jesus used a Greek word for love (“agape”) and that Peter responded with a different Greek word (“phileo”). It’s as if Peter couldn’t accept the restoration Jesus was pouring out on him. So the third time Jesus asked the question, He used Peter’s word, “phileo” – fully coming down to Peter’s level in order to lift Peter back up again. But there’s more to the story. Each of the three times that Jesus restored Peter back to love He reminded Peter that he was still useful to Jesus! Each time He reminded Peter of God’s call on his life to shepherd, feed and tend God’s sheep. Each time He reminded Peter that no matter how much he had messed up, God still loved Him and had a purpose for his life! So let me ask the questions again. Have you ever messed up? Have you ever made such a mistake you thought you could never get over it? Have you thought about just quitting? Don’t do it! Jesus still loves you and has a purpose for your life, and even for your scars. Could it be that God will use your failure, and your recovery, to encourage someone else? Could it be that your scars will give someone else hope? Could it be that you’re still useful to God? Yes, it could be! In fact, it is! Just don’t quit! How do you take back that lost ground? Do what Peter did. Run to Jesus. Talk to Jesus. Listen to Jesus. And tell Him you love Him! He’ll take care of the rest.